Signing off on the 2017 NRL Grand Final | MAX Solutions. 33 year old Sharon Xabregas signed the Australian national anthem at the 2017 National Rugby League (NRL) Grand Final. Hard of hearing since birth, Sharon knows the difficulties of living with disability. With an older brother who is deaf, Sharon communicated solely in sign language growing up. “Sign language was my first language; I didn’t start talking until I was five,” she said. Also thought to be deaf, it was not until Sharon started school that doctors determined she had some hearing and could also speak. Sharon was then moved from deaf school into mainstream schooling, which she says benefited her greatly. “I felt a little more isolated when I was put into mainstream school because I was so used to being able to sign, but I learnt to adapt … I became very independent, I learned how to speak and how to lip read." Now the NSW Disability Employment Services Account Manager at MAX, Sharon has worked in disability employment services since she was 21, helping other people with disability gain permanent work. After a year of rejection after rejection, Sharon began to hide her disability in order to get work. “If I never went through that I wouldn’t have been able to see it from a job seekers point view. That’s why I’m in the industry of trying to help people with disability." Nearly 80,000 people filled Sydney’s ANZ stadium for the 2017 Grand Final, with over four million more tuning in at home. To stand up in front of that many people could be daunting for some, but when the NRL reached out to The Deaf Society, they had one person in mind who they knew would be perfect for this event. Sharon has previous experience signing on medical conference panels for thousands of people, advocating the use of Auslan (Australian Sign Language) for deaf patients in hospitals. “I’m pinching myself that I got this opportunity,” Sharon said. “It’s a huge honour to be able to represent the deaf community and represent your country." Sharon hopes that she will inspire many others to open up about their disability, and not be embarrassed to speak out. 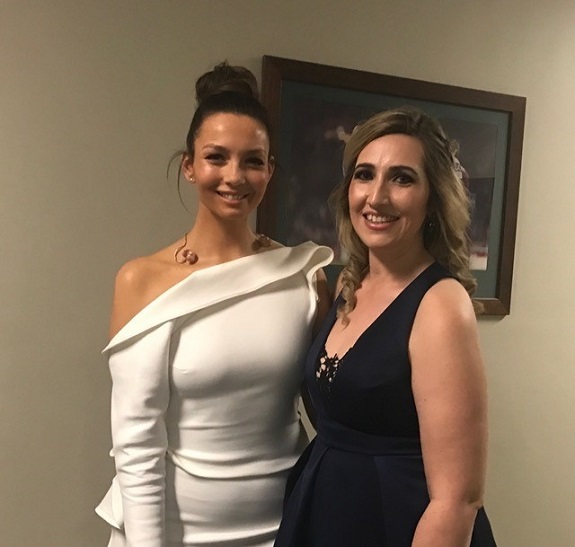 Image caption: Ricki-Lee Coulter with Sharon just before heading on stage.